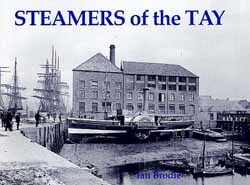 This readable and accessible account of the history of steamers on the Tay is illustrated with pictures of all the key vessels, as well as passenger certificates and illustrations from guidebooks. Various Tay passenger ferries are prominently featured. We learn the history of the Tay train ferry – the second in the world after the one across the Forth – and holiday excursion traffic is also included. The excursion vessels are photographed at destinations including Dundee, Newburgh, Broughty Ferry, Bridge of Earn and Balmerino. The author has included photographs of the very last ferries to operate between Dundee and Newport prior to the opening of the Tay Road Bridge, and the excursion story is brought up to date with pictures of vessels that have appeared on the Tay in more recent years. The final three pages of the book cover Loch Tay.